The idea of a “return to form” seems a ill-fitting concept for a band with 28 years, 22 top tens and 12 albums on the clock. 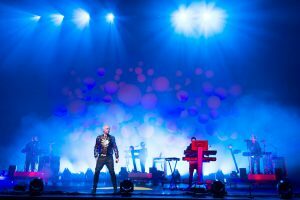 Yet, for those who hold up their imperial age (’80s to mid-’90s) as being responsible for some of the greatest pop music ever made, a new record by Neil Tennant and Chris Lowe is always a huge event, and—the odd humdinger of a single aside (2004′s “Flamboyant”, say)—an exercise in mild disappointment. It’s was with uncapped joy, then, that we presented the video premiere of “Vocal”, a return to their dance music roots after the more middle-aged ruminations of Elysium. However, in the spirit of all PSB’s work, the dancefloor isn’t the only muse at play on Electric—there’s always a Che Guevara to every disco beat. Michael Gambon, Berlin, David Lodge, Bolshevism… the list of references in Electric might take some close reading to unpick. Who better than to guide you through than the Boys themselves alongside producer Stuart Price? This exclusive track-by-track is the record in their words.